GPM-06C is used where only one detection point for oxygen is needed. 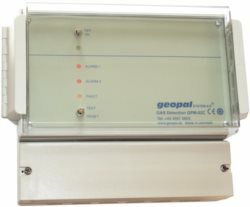 The relay circuits in the GPM-06C system has relay contacts for low alarm level, high alarm level and system error. The relay circuits facilitate the control of external functions like ventilation systems, magnet valves, alarm bells, etc.